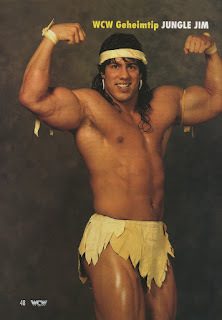 James Rocha began wrestling in the 1990's debuting in WCW in 1993 as "Jungle" Jim Steele in World Championship Wrestling. 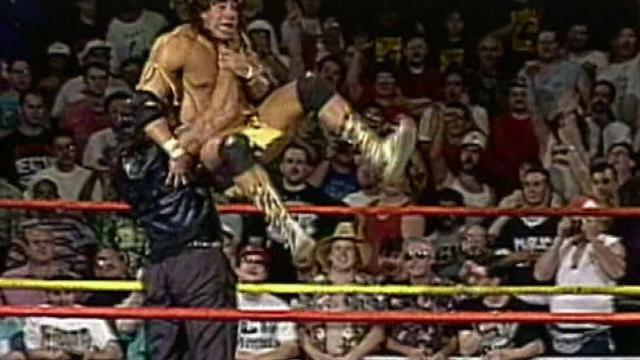 I remember seeing him on WCW Saturday Night but his biggest match of that WCW run was at the SuperBrawl IV pay-per-view where he defeated The Equalizer. Leaving WCW in 1994 he traveled to All Japan Pro Wrestling teaming with Danny Spivey in the 1994 Real World Tag League they finished with two points. In 1995 he had a dark match in WWE, and was defeated by 911 in ECW. In All Japan he wrestled under the mask as The Lacrosse until 1998. From late 1995 through 1997 he wrestled occasionally as Jim Steele in World Wrestling Council in Puerto Rico holding their version of the World Television Championship for 28 days. In late 1997 he removed the mask becoming Wolf Hawkfield, based on the Virtua Fighter character, teaming with Johnny Smith for the 1997 Real World Tag League finishing in 5th place with ten points. On January 9, 1998 in Kagoshima, Japan teaming with Johnny Smith they defeated Jun Akiyama & Takao Omori for the All Asia Tag Team Championships. They held the championships for 270 days losing the titles to Tamon Honda & Jun Izumida on October 6, 1998 in Niigata. As Hawkfield he made two appearances in November 1998 in ECW defeated Tommy Rogers. His last appearance in All Japan as Hawkfield was October 28, 2000. Less than a month later as Jim Steele he teamed with Mike Barton in the 2000 Real World Tag League finishing with ten points. November 3, 2001 Steele defeated Invader 1 to win the WWC Puerto Rico Heavyweight Championship holding the title until November 24th losing it back to Invader 1. 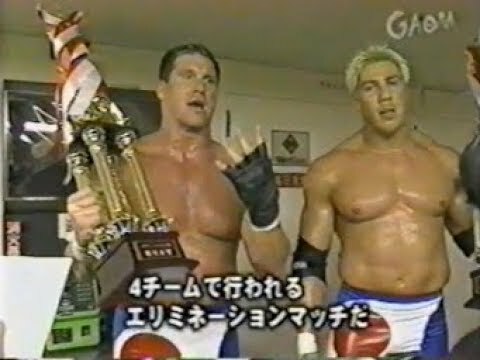 The following year Steele and Barton traveled to New Japan to compete in the G1 Tag League losing in the finals to Kojima & Tenzan. On July 7, 2002 he and Barton won the Stan Hansen Cup. They remained with All Japan until November 2002 when he and Barton returned to New Japan where he would stay until early 2004. In December 2003 he and Barton had a couple tag matches in the WWE. Steele returned to All Japan for a short run at the end of 2004 as Love Machine Steele. This would he his last run in Japan. In 2005 he had a few matches in WWC and his final match came on April 26, 2008 losing to Orlando Colon in the WWC Universal Title Tournament in Bayamon, Puerto Rico. Left to Right: The Lacrosse, Wolf Hawkfield, & Jim Steele all released by BBM Magazine in 1996, 2000, & 2004 respectively. I mailed these cards to Mr. Rocha after reaching out to him on Facebook. I'm very appreciative that he signed all three cards for me as the name of each person he portrayed on the cards. 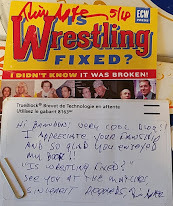 I sent him an extra The Lacrosse & Wolf Hawkfield that I had and I am actively looking for a Jim Steele 2004 BBM to send him as well if anyone has one. Thanks for reading, please leave a comment, read my other posts, and like my blogs Facebook page and while you're at it check out my weekly podcast The Wrestling Insomniac on the Nerdy Legion Podcast Network.